How far behind can I get before I need a time warp or worm hole to find my way back to any possible sense of normal? I wonder who holds the secret to time management and time organization? I can’t imagine there are too many books and articles I haven’t read. I tried the time diary, but that just took too much time. I manage all of my lists (a master list for the week with a daily list of necessary items, a grocery list on the fridge, a pocket list for daily notes and the list of lists in my office… not kidding), I keep an eye on my calendars (one I carry with me, the mat calendar on my desk, the family calendar on the fridge and a write on/wipe off in my sewing studio… again, not kidding), and I set my timers/reminders every morning (I love that little ding on my phone… it saves me at least twice a day). But sometimes those things are just not enough. I read that 8.4% of Americans suffer from “emotional chaos”; 40% of us do not take our allotted vacation time because we don’t want to deal with the mountain of work when we return, and a full 65% have daily feelings of “being overwhelmed by inadequate time.” I can be found in all three of those demographics. There was a good article in the Huffington Post by blogger Vanessa Loder about a new book by Brigid Schulte, who is an award-winning journalist for the New York Times. She is the best selling author of a new book: Overwhelmed: Work, Love, and Play When No One Has The Time. In her book, Brigid discusses how time pressure and modern life have led to a constant feeling of being overwhelmed which is affecting our health and even the size of our brain. She shows us how role overload, something called “time contamination” (I’m sure I suffer from this), social structures, and even our own subconscious beliefs can lead to this constant sense of urgency, consuming guilt, and a certainty that we are inadequate both at work and home. The article is very interesting, and if Brianna gets ahold of this post, maybe she will link it for you (yes, I am inadequate both at work and at home). It compares American mothers and workers to Danish counterparts. We stay late to get everything done but if a Danish employee stays late they will be reprimanded as it would seem they must not be as productive as a fellow employee who can get all of their work done in the same 8 hours. Interesting. How can they be so much more focused? It is certainly true I am distracted by all things shiny and anyone who speaks to me. We call it ADOP (attention deficit… Ohh Pretty!! ), and it is equally true I could never complete my daily work in only 8 hours. That it just funny. I wonder if I just take my leisure time for granted. My job is also my hobby so I think I forget to count all of the classes, samples and patterns I work on at home as “work”. I sew in the evening but I never seen to get everything done that is on my list. And when I stay home during the day to get something done, people wonder if I have retired because they don’t see me at the shop. A slippery slope down a mountain of sewing. A rough life…. I am going to spend the next two afternoons at home catching up. The tutorials, posts and patterns I have on my “to do” list are important. 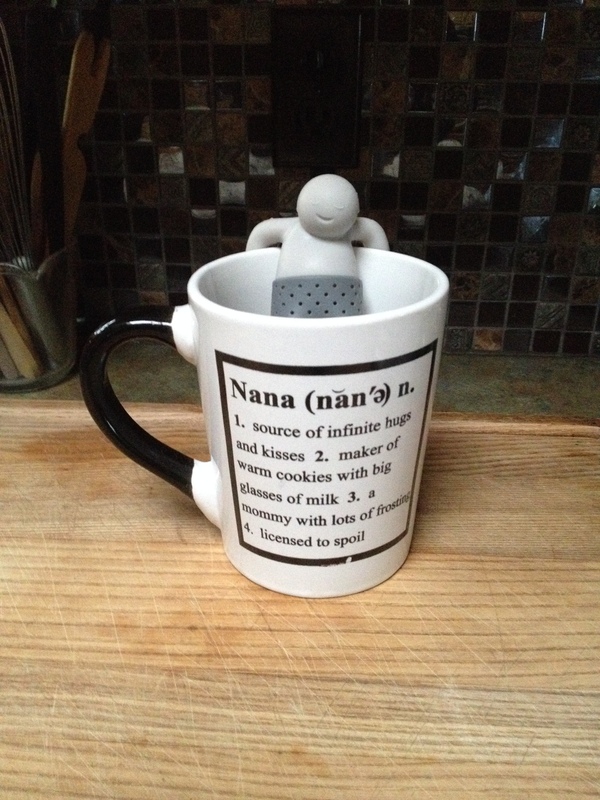 My secret weapons are loud music, ginger tea and warm socks. I have to get caught up so I can enjoy my weekend. I have a retreat planned that I am hosting at the retreat house and I am REALLY looking forward to it. We have a fun group signed up and the casual comfort of a house vs the classroom will be fun. so… watch for my videos and blog posts… my plan is to be caught up by Friday morning… (but no breath holding… just wishful thinking and prayers will do). Our Retreat House opened two months ago and has been VERY popular! It is a beautiful, comfortable, fully equipped home that sleeps 10. There are ten tables, ten adjustable Koala chairs and ten portable 4′ x 6′ design walls. So the design walls have been a big hit and we’ve had lots of requests for directions to make them. They are very light weight, easy to move around and very easy to use with the flannel ‘grippy’ wall along with the added ability to use stick pins. I made all of the design walls in the garage. Each one took about 5 minutes and $40 worth of supplies. 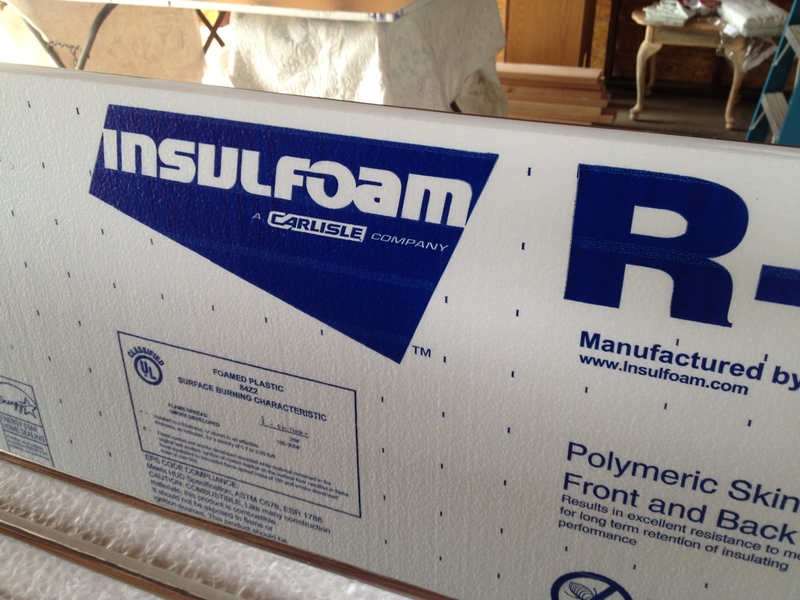 I started with a foam core insulation board. These can be purchased at Lowes or Home Depot. They are 1″ or 2″ thick and 2′ x 8′ or 4′ x 8′. I selected the 2″ thick boards, and 4′ wide by 8′ tall. It cost about $15. I cut 24″ off of the top of the board so they would fit nicely in the house without rubbing up against the ceiling. 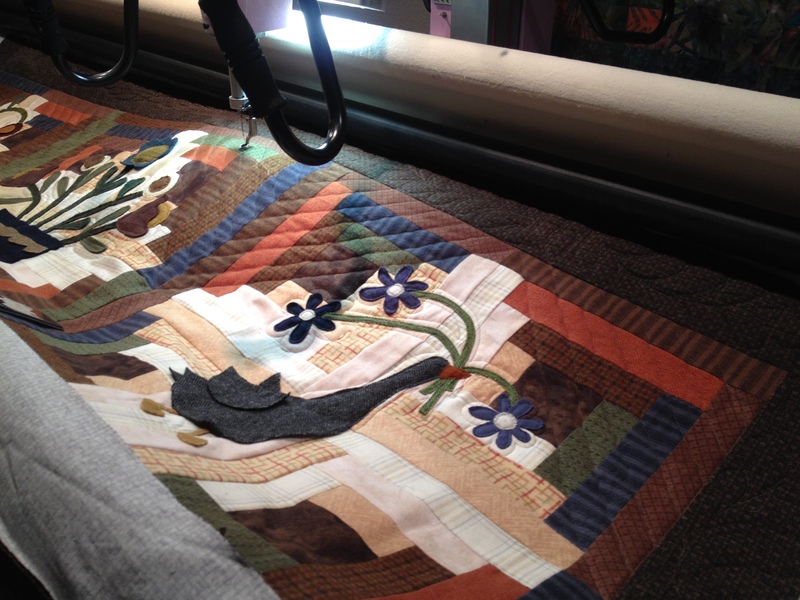 Also, not many quilters are tall enough to use the full 8′ of space. So this made the boards 4′ wide by 6′ tall. They can be easily cut with a box cutter or sharp kitchen knife and a ruler. Once cut, I laid the board on a set of draped saw horses. 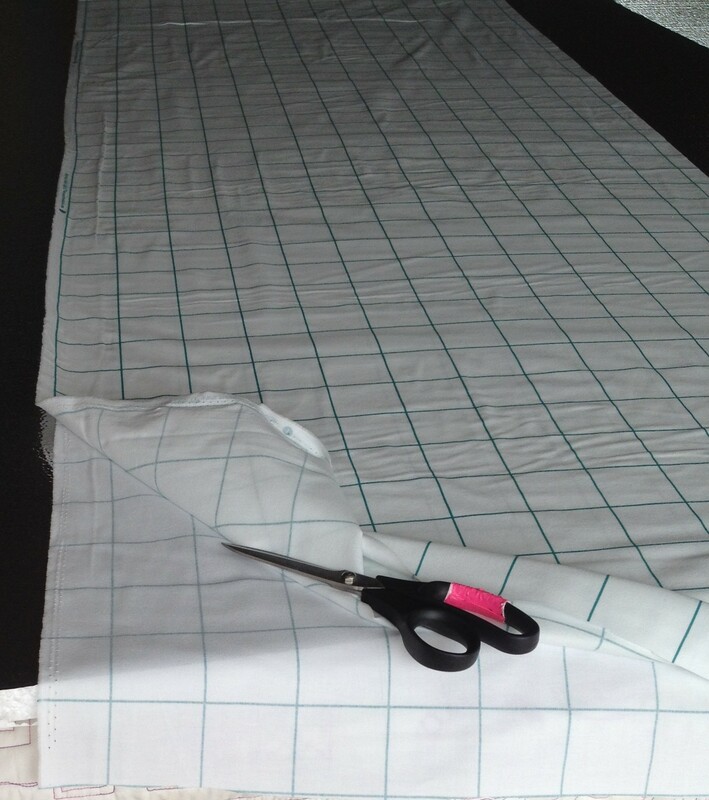 Then I cut 2 1/8 yards of the gridded flannel fabric. 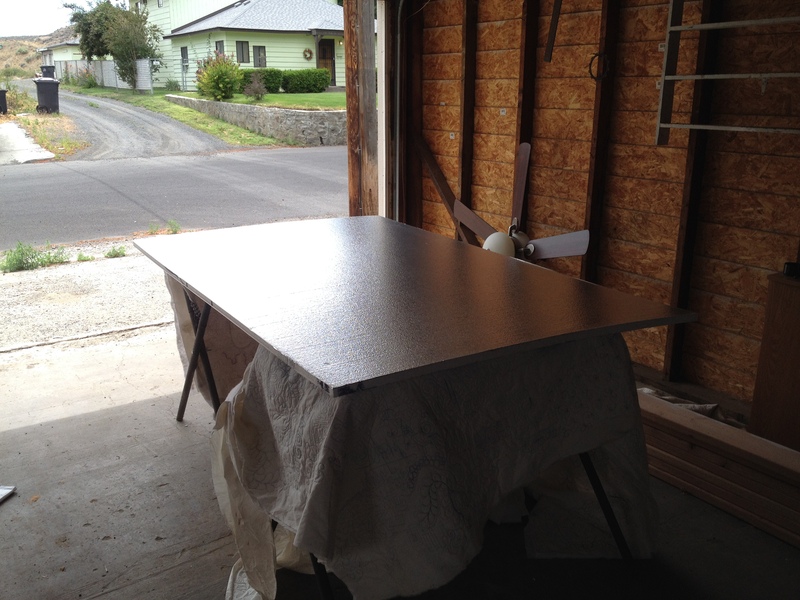 It is 54″ wide, so the 76 1/2 cut is perfect for the 4′ x 6′ board. The next step is to lay the flannel over the board, but first I sprayed it with 505 Basting Spray. This just made it easier to keep everything neat and right where I wanted it. I was able to make all 10 boards with just one can of 505. 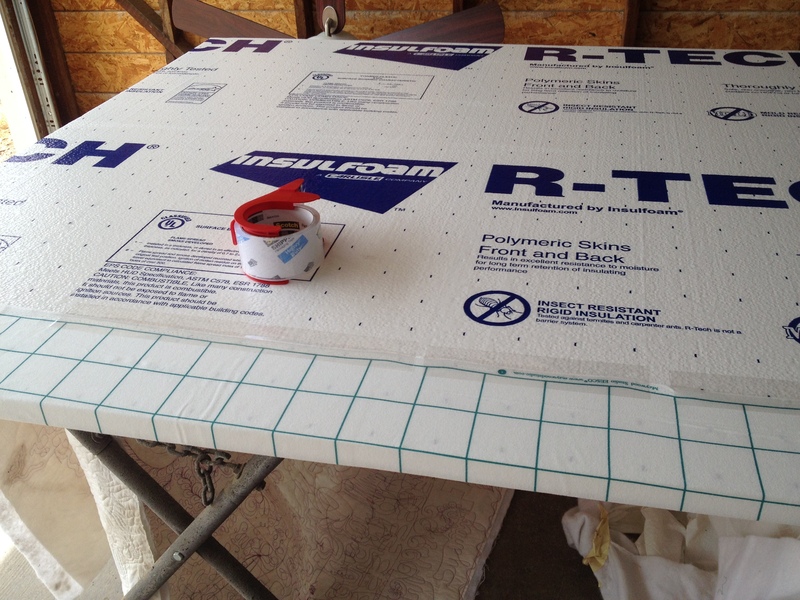 When you smooth the fabric down, just make sure you have a couple inches hanging over each side. 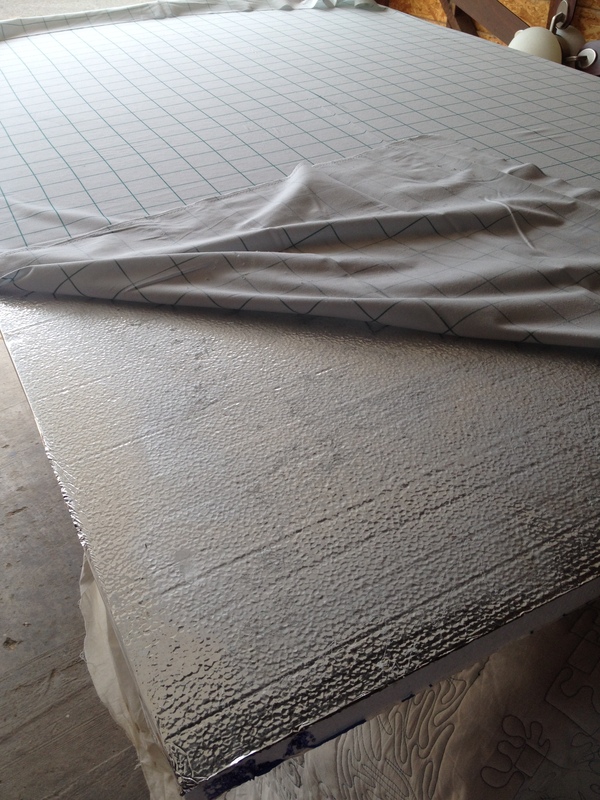 Continue to smooth until the top looks nice, then flip it over and begin securing the fabric. 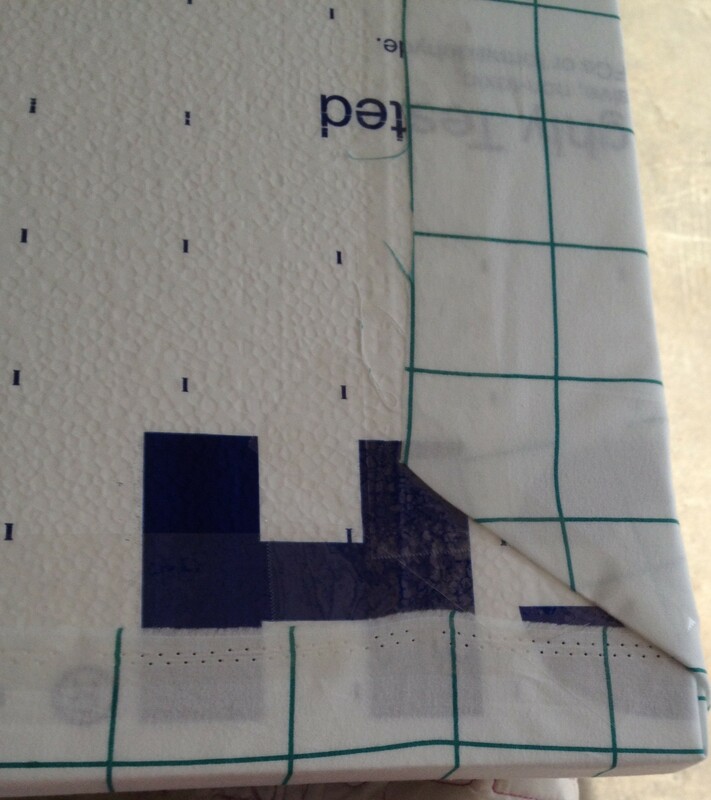 Staples made sense at first, but they were difficult to use with the soft board so we chose a strong, clear packing tape which worked very well. The corners are finished just like a present. The pictures may not show clearly… there is a lot of tape. Two layers. I don’t want anything to come loose. After the taping… the design wall is done! Ready to use. I hope you found this helpful, maybe you have need for a lightweight designwall! Such a busy week!! Lots of late nights, and still too far behind! I teach 15 classes/month, five are this week and I have only done the preparation for two of them. That may not sound so bad, but three of the five are hand stitching. Yikes. Maybe I need to step it up by adding earlier mornings to my late nights! One reason I am so busy is because of our new venture. We bought a beautiful five bedroom, two bathroom house that we are turning into a retreat center. It is a beautiful home, but it needs a little work, and unfortunately, we closed 7 days later than anticipated. We already scheduled the open house… which is just 3 weeks away. Does this yard look like it is ready for an open house? Two sore days later, it is starting to look better, even the grass is starting to green up. But we still have to re-tile the bathroom, fix the grout in the kitchen, fix a kitchen cabinet, replace the kitchen sink, put in the bathroom pedestal, install all new appliances, fix some dry wall, paint, install window coverings, shampoo the rugs, clean, and of course, furnish. 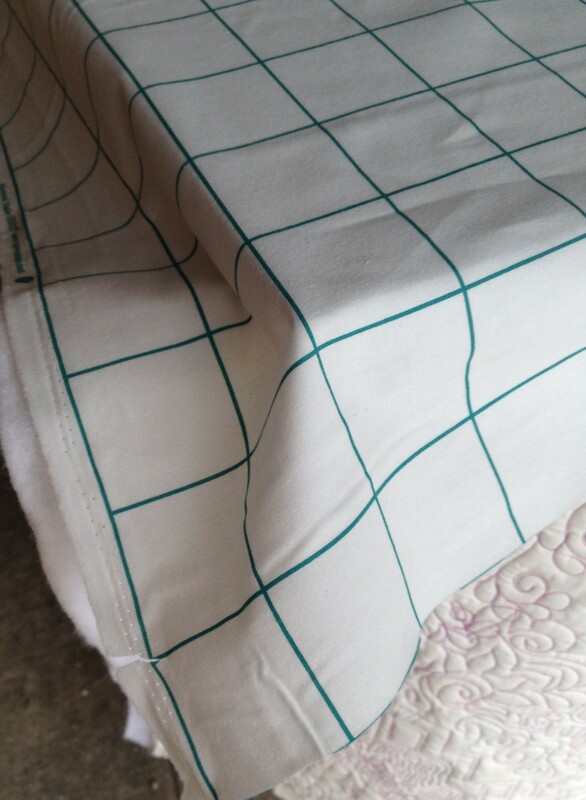 In addition, we are making 10 new quilts for all of the beds. Yes, I do have LOTS of quilts. Just none in the size I need!! Worse yet… I am leaving for quilt market next Monday. Brianna and I will be gone for a week, we’ll get back just four days before the open house for the retreat house. 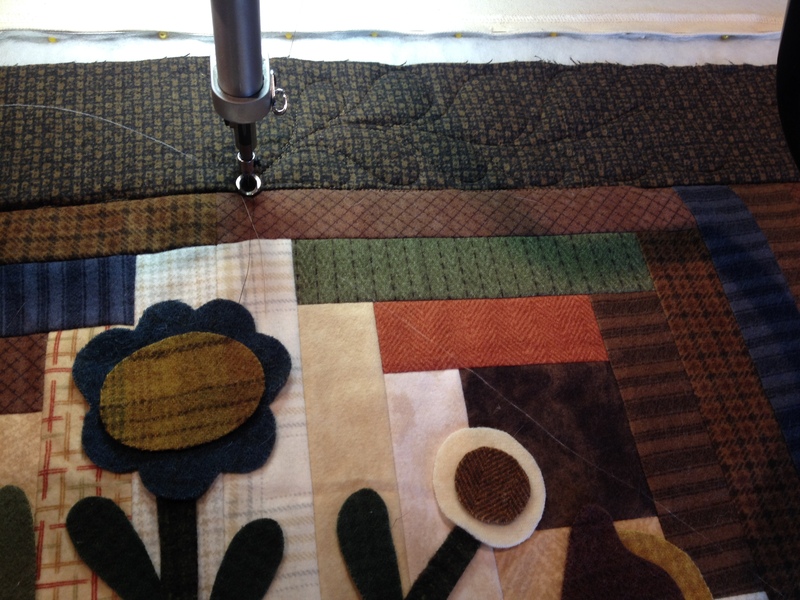 So tonight, I am finishing up a quilt on the machine and working on one of the upcoming classes. 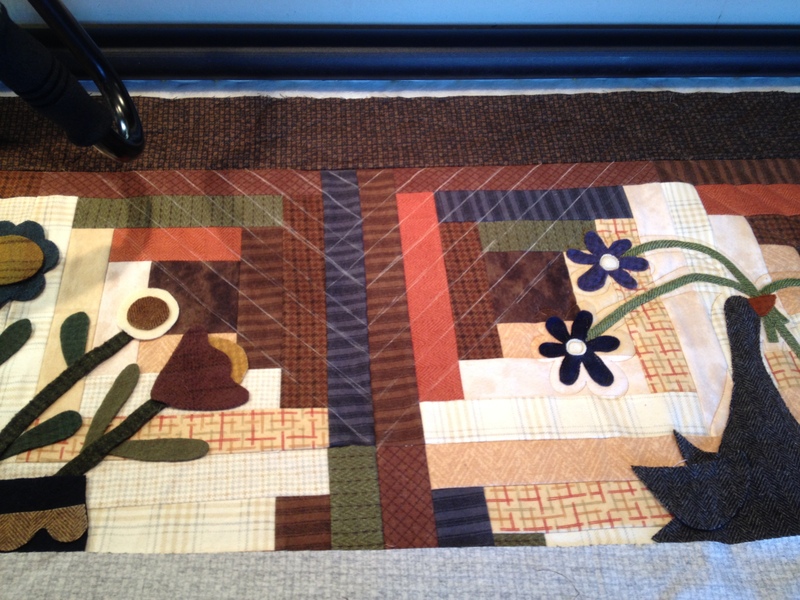 I have three customer quilts to get done before I can start quilting the retreat house quilts. This one is called Log Cabin Garden. It was a block of the month we just finished up. It is flannel log cabin blocks with wool applique. 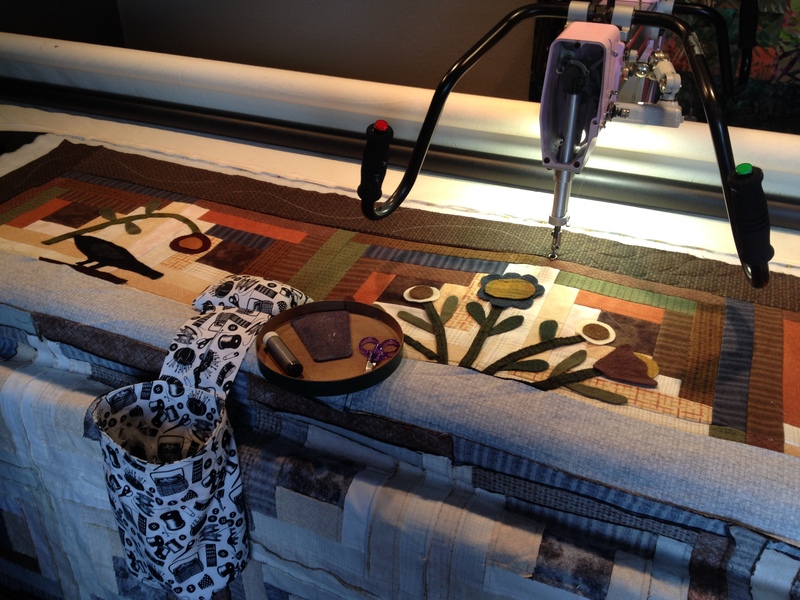 The original pattern had 6 different applique patterns, I drew up 3 extra so we would end up with an 84″ x 84″ quilt. 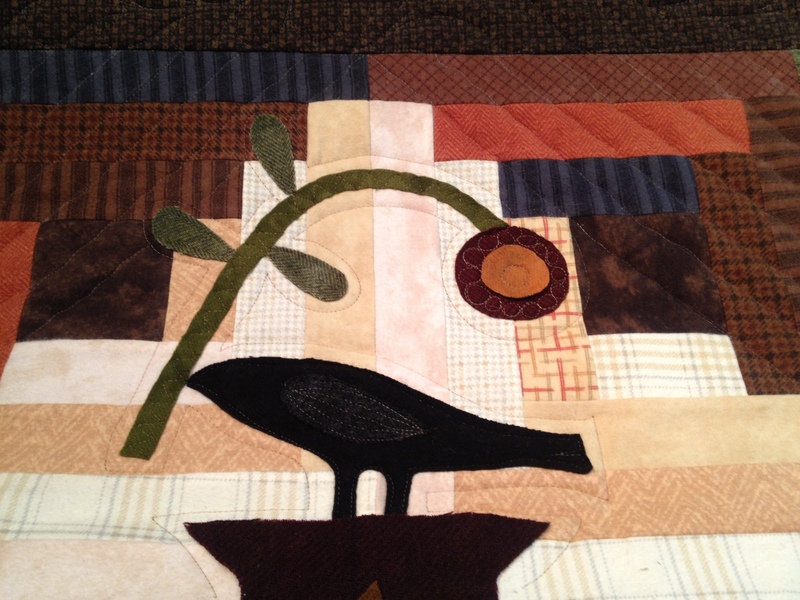 This is the original pattern, I added a goose, a saltbox house and a tree (pics tomorrow when it is all the way done). We cut a few more kits after the class due to it’s popularity in the shop. The flannel, pattern (plus the extra three) and all of the wool is just $280. We have three left. It’s a very good price considering the amount of wool that is in the kit. The cat pictured is 14″ tall! The hardest part about quilting is the planning. Feathers? Outline? Filler? Edge work? Stencils? Too many options for a busy brain. 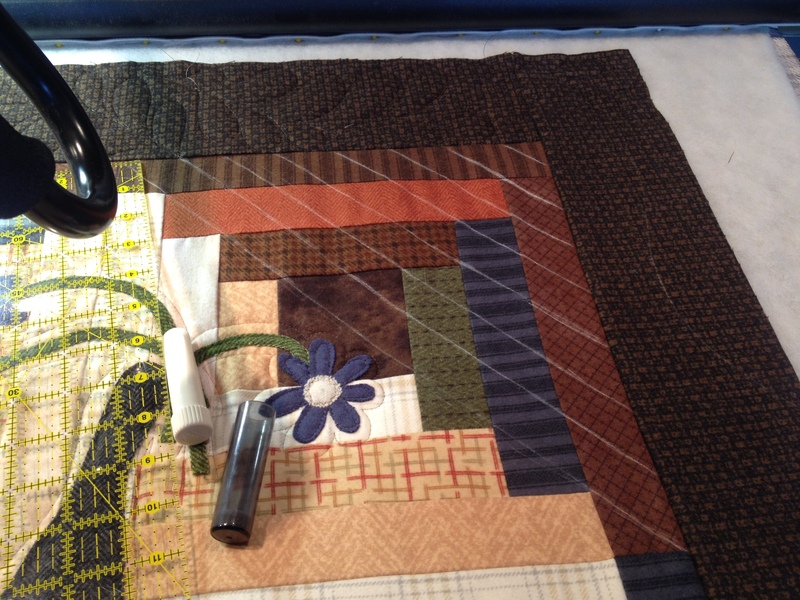 For this quilt I am going to do a random primitive feather in the border, diagonal lines, echo and a filler. The feather is the easiest part. I love feathers. I always have to be careful – not everything looks good with feathers on it. I always start with a line. 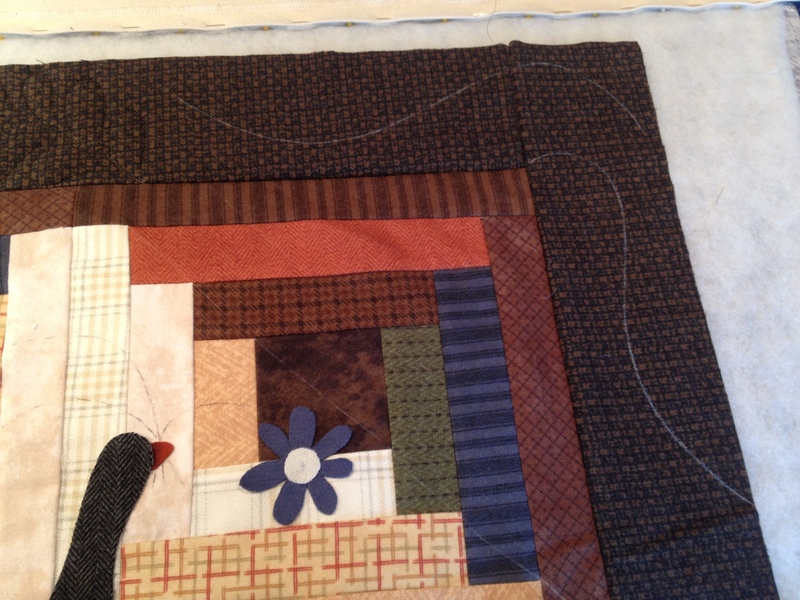 I feather around the line, then stitch my center line last. I think that may be backwards, but if I don’t do it that way, I end up with a very thick, scribbly center. I like primitive feathers, they have separated plumes. For the diagonal lines I first need to draw the lines. I am using a chalk pen and a basic ruler. I am not guiding the machine along the ruler, I am just using the ruler to mark the lines, one inch apart. I like to use the chacoliner filled with the iron off white chalk. This was my last picture, but I was actually halfway done when I stopped. I like the way it is turning out. My machine is a trooper. Flannel back, wool batt, flannel top and sometimes three layers of wool. No problem for my 18g needle and 50 wt thread. Full picture tomorrow. On to class prep for A Rainbow Garden. WONDERFUL quilt!! Our new wool block-of-the-month for this year. We just started on our first block. This block is wool applique on Diamond Textiles wovens. 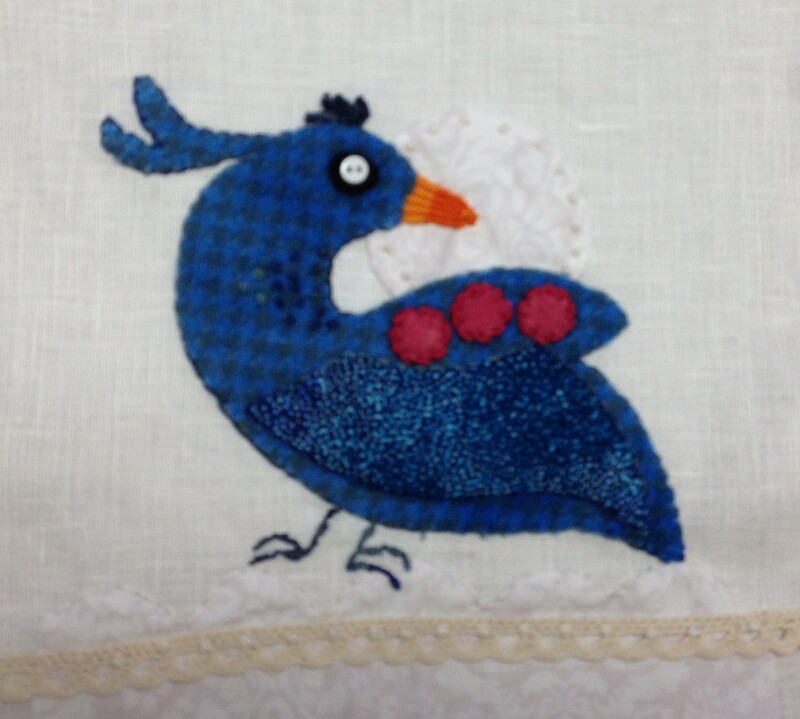 We’ve added Kathi’s embroidered suggestions and my favorite… beads! I have a bunch of the french knots done, but lots of embroidery left! But it will have to wait…I have to head to bed. 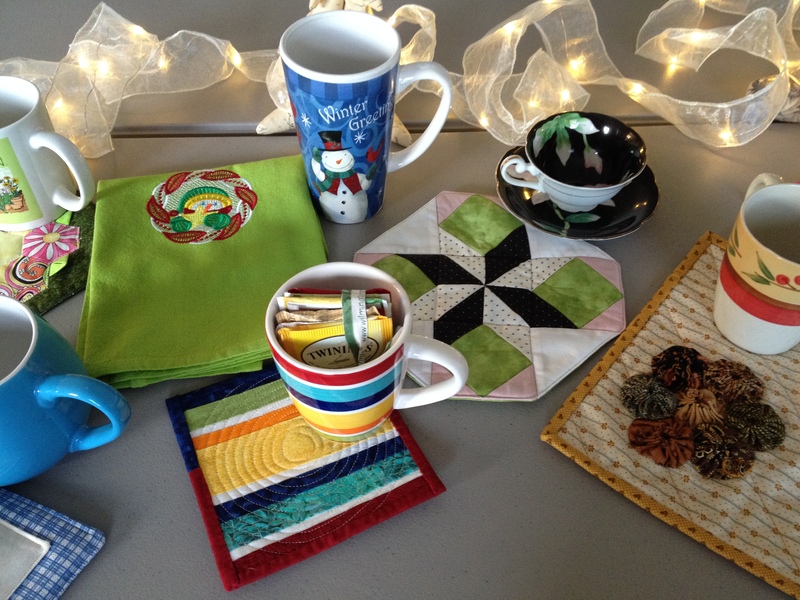 Up early tomorrow to finish the machine quilting, make a pincushion for pincushion club, cut the blocks and type the handout for Prairie Women’s Sewing Circle and piece the shower curtain for the Retreat House. Fred is unconcerned with the amount of work that has to be done. He heads to bed by 8pm every night (wish I could do that). He is our blind lab. You’d never guess he was blind. He gets around just fine. His nose is beyond perfect. And no.. that is not a staged picture. 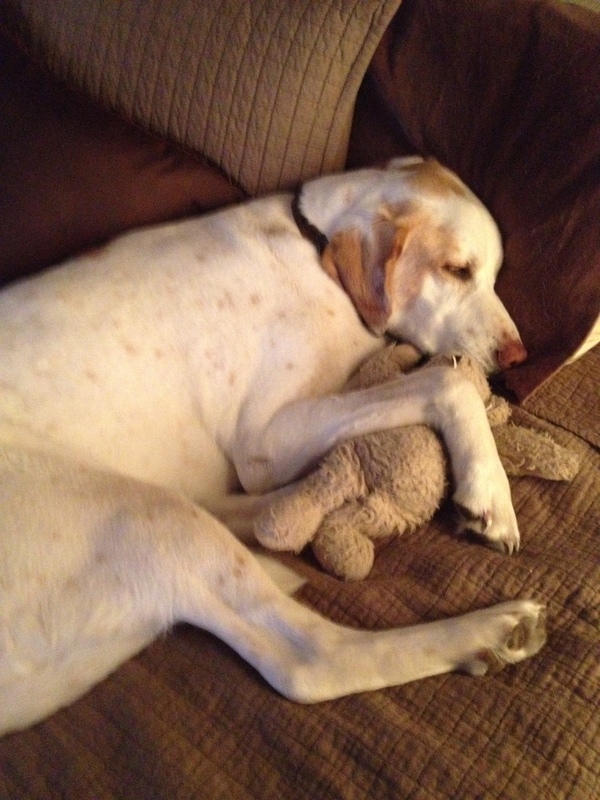 He sleeps in the spare room with a pillow, a cat and a teddy. He doesn’t get a quilt… he sheds too much for that. So it’s time for me to make like Fred… and head to bed.